With my new SSD installed it was time to run some speed test. Since I bought the SSD to speed up my photo workflow, I decided to use Lightroom for my speed test. I was importing 100 photos (1.44GB) off a SanDisk Extreme IV Compact Flash 45MB/s via a SanDisk FW800 flash card reader. 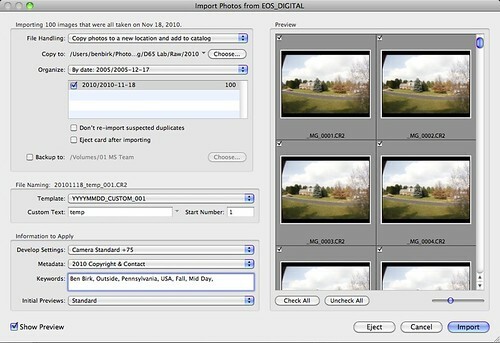 All photos were copied to my internal drive via the Lightroom import interface and then added to my library. As part of the import process they were renamed, applied a developing setting metadata a few keywords, and standard sized previews were rendered. 1min 20 seconds to import and 1min 22 seconds to render previews. Total Time: 2min and 43 seconds. 2min 30 seconds to import/backup and 1min 15 seconds to render previews. Total Time: 3min and 45 seconds. 2min 27 seconds to import/backup and 1min to render previews. Total Time: 3min and 27 seconds. The SSD was 100% faster then the HDD during the import stage of each test. There was no speed increase during the rendering stage but I believe that is because the CPU handles this process. 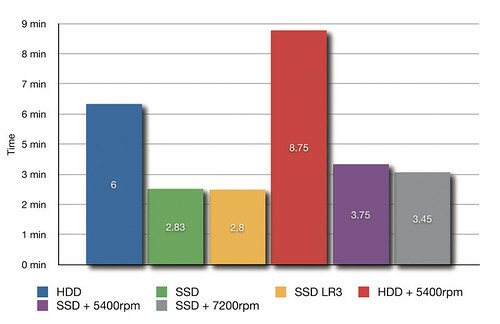 Using Lightroom 3 showed no significant speed increase during the test. USB 2.0 kills any speed increase the 7200rpm drive has over the much slower 5400rpm WD Passport drive. This is one of the few posts I found were someone had excellent results with LR and SSD drive. Is the cache folder installed on the SSD too? What about wearing the lifespan of the drive? Did you found any recent topics about LR and the wear level? Yes the Cache Folder is installed on the SSD. No idea on the lifespan of the drive. No idea about other topics regarding wear level. Thanks for the answer Ben! I’ll try moving my catalog and cache to my SSD drive and do some benchmarks. How did you measure the time exactly? Trying to measure my own speeds on my comp.. I used a clock with a second counter. Wrote down the time started and time stopped. Just an update for everyone. It’s been two and a half years. The drive is still running strong. I moved it into my new MBP about a year ago and there have been no problems.